Here at Lift King, we take our quality and service very seriously! 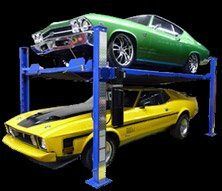 We’ve been serving Calgary for many years, and we’ll be here to honour our warranty and provide service to your interior lifts whether you need help tomorrow or in a decade! Our interior lifts have a 5 year manufacturer defect warranty on the motor and a lifetime defect warranty on the lift. A Guarantee is Only as Good as the Company Who Offers It! Other interior lift companies say they will guarantee your product for a lifetime, but half of our competitors only started selling interior lifts this year! Last year they were selling mini bikes, so who knows what they’ll be selling next year. They offer discount pricing on inferior lifts and offer long warranties, because they know when it comes time to fix the lift, they’ll have already folded the company and started a new one selling cheap watches — or whatever the new hot item may be! These people may be around in a week or a month, but do you really trust them to be there in a year from now to guarantee your lift?